78 T/A in the movie "Hooper"
Topic: 78 T/A in the movie "Hooper"
Just wondering if anyone has seen the movie "Hooper" from 1978 with Burt Reynolds. In the movie, Burt stars as a stuntman and his co-star is Jan Michael Vincent. At the end of the movie, they launch a rocket car (Red 78 T/A) over a blown up bridge! When the car takes of from the ramp, it's suddenly stretched out about 3 feet! Does anyone know if this was a reall 78/ T/A that was stretched to accomodate a rocket, or was it just a rocket witha stretched out T/A body? Thanks..
Re: 78 T/A in the movie "Hooper"
I've seen the movie but it's been awhile...don't recall any details other than what you mentioned....sorry. 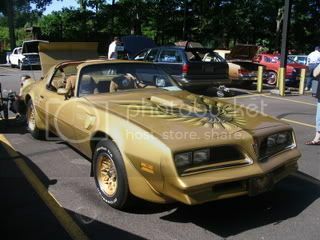 I'm not sure of the exact details, but the car that they drove around was a real '78 T/A. The car that made the stunt jump was not an actual T/A. I read once that is was a special chassis to hold the jet engine with a funny car style body on it. Not sure if that is accurate info or not though. That sounds about right. Now that I think about it, its probably one of those jet engine funny cars! Sure doesn't look like the bird made it into that shot It's hard to make out what it is...any guesses? No guess....but it is one of my favorite movies. I've even heard that the Hooper bridge jump was all special effects and not a real jump at all but don't quote me on that. The car used in the scene to jump the blown up bridge in Hooper was a model car. It was NOT a T/A. Hooper? Naw never heard of it. Keep on Moppin' in the Free world. T-tops? We don't need no stinkin' T-tops! That's what I'd heard too... and it looks like a model in the shot t'boot! "Trans Am! What's your pleasure?" And did you notice the gas prices in the Hooper clip on YouTube... 57 cents! Man... I wish! HAHA check out 2:40 what thw heck is on the roof? Whoa a thread from the dead ! 2007? !